Almighty God, in Christ you make all things new: transform the poverty of our nature by the riches of your grace, and in the renewal of our lives make known your heavenly glory; through Jesus Christ your Son our Lord, who is alive and reigns with you, in the unity of the Holy Spirit, one God, now and for ever. Amen. Your love, O Lord, reaches to the heavens ♦ and your faithfulness to the clouds. Your righteousness stands like the strong mountains, your justice like the great deep; ♦ you, Lord, shall save both man and beast. How precious is your loving mercy, O God! ♦ All mortal flesh shall take refuge under the shadow of your wings. They shall be satisfied with the abundance of your house; ♦ they shall drink from the river of your delights. For with you is the well of life ♦ and in your light shall we see light. O continue your loving-kindness to those who know you ♦ and your righteousness to those who are true of heart. Concerning spiritual gifts, brothers and sisters, I do not want you to be uninformed. You know that when you were pagans, you were enticed and led astray to idols that could not speak. Therefore I want you to understand that no one speaking by the Spirit of God ever says ‘Let Jesus be cursed!’ and no one can say ‘Jesus is Lord’ except by the Holy Spirit. Now there are varieties of gifts, but the same Spirit; and there are varieties of services, but the same Lord; and there are varieties of activities, but it is the same God who activates all of them in everyone. To each is given the manifestation of the Spirit for the common good. To one is given through the Spirit the utterance of wisdom, and to another the utterance of knowledge according to the same Spirit, to another faith by the same Spirit, to another gifts of healing by the one Spirit, to another the working of miracles, to another prophecy, to another the discernment of spirits, to another various kinds of tongues, to another the interpretation of tongues. All these are activated by one and the same Spirit, who allots to each one individually just as the Spirit chooses. On the third day a wedding took place at Cana in Galilee. Jesus’ mother was there, and Jesus and his disciples had also been invited to the wedding. When the wine was gone, Jesus’ mother said to him, “They have no more wine.” “Dear woman, why do you involve me?” Jesus replied. “My time has not yet come.” His mother said to the servants, “Do whatever he tells you.” Nearby stood six stone water jars, the kind used by the Jews for ceremonial washing, each holding from twenty to thirty gallons. Jesus said to the servants, “Fill the jars with water”; so they filled them to the brim. Then he told them, “Now draw some out and take it to the master of the banquet.” They did so, and the master of the banquet tasted the water that had been turned into wine. He did not realise where it had come from, though the servants who had drawn the water knew. 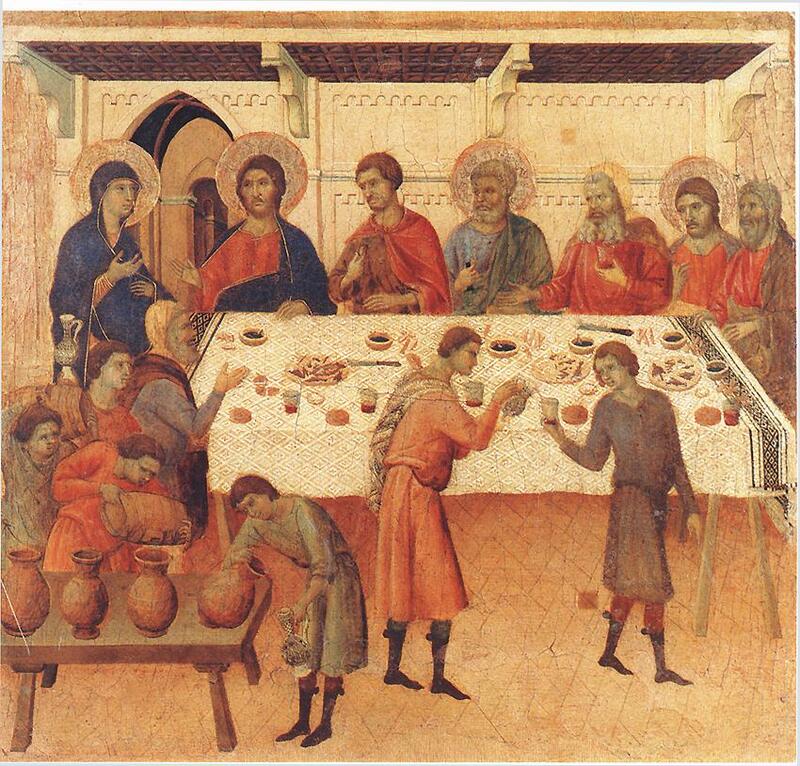 Then he called the bridegroom aside and said, “Everyone brings out the choice wine first and then the cheaper wine after the guests have had too much to drink; but you have saved the best till now.” This, the first of his miraculous signs, Jesus performed at Cana in Galilee. He thus revealed his glory, and his disciples put their faith in him. Let us pray to our Lord, the bountiful giver of love and mercy. Lord of wisdom and discernment, deliver our Church from the delusion that we, as Christians, are better than others; or that one denomination of Christianity, or one tradition within Anglicanism, is alone faithful in discerning your message to us. In the light of this week’s meeting of the Anglican Communion in England, may we resist the inclination to criticise one another, but instead kneel together in all humility at the communion rail, certain only in your mercy and your truth. Lord, you are the wellspring of all our spiritual nourishment: in your mercy, hear our prayer. Lord of celebration, take the tapwater of our lives, all that we see as routine and humdrum, and infuse it with your splendour. Take our dullness and our limited vision, obsessed with the next step along the path, and raise our eyes instead to the magnificence of your creation. Give us a glimpse of our part in the cosmos, as we lose ourselves in wonder, love and praise. Lord, we thank you for all who enrich our community through their abilities and spiritual gifts. Teach us to recognise these gifts in each other, and to encourage one another to offer themselves for the common good. Help us also to hear your voice, Lord, in calling each of us to the task you would have us undertake. Lord, look with your love on those who are exhausted by emotion or numbed by their suffering; those who do not know which way to turn next. We think particularly of those fleeing the scourge of war, and no longer able to live safely in their own homes; those who have sought temporary refuge in the camps, in the hope that they may be assured of shelter, food and warmth. May their trust in the humanity of fellow human beings not prove misplaced as we respond in your name. Lord, as we pray for the departed, we remember with thanks all that they gave to the life of this world. Grant them joy in the everlasting marriage feast of heaven.